Fall Baby Showers are always a fun time and with fall comes some wonderful shower themes. How about hosting a Halloween Baby Shower...with the fun shower accessories and decorations you find here it will be easy to plan a shower with this festive holiday as it's theme. Halloween is such a fun time of year and it will be even more exciting this year with the prospect of a new baby girl or boy. So go ahead and plan that baby shower with this fun Pumpkin theme. Just take a look at the party supplies I found with a Halloween theme: Baby Shower Invitations, Baby Shower Banners, Baby Shower Decorations, Shower Centerpieces, Diaper Cakes, Shower Party Food Ideas. 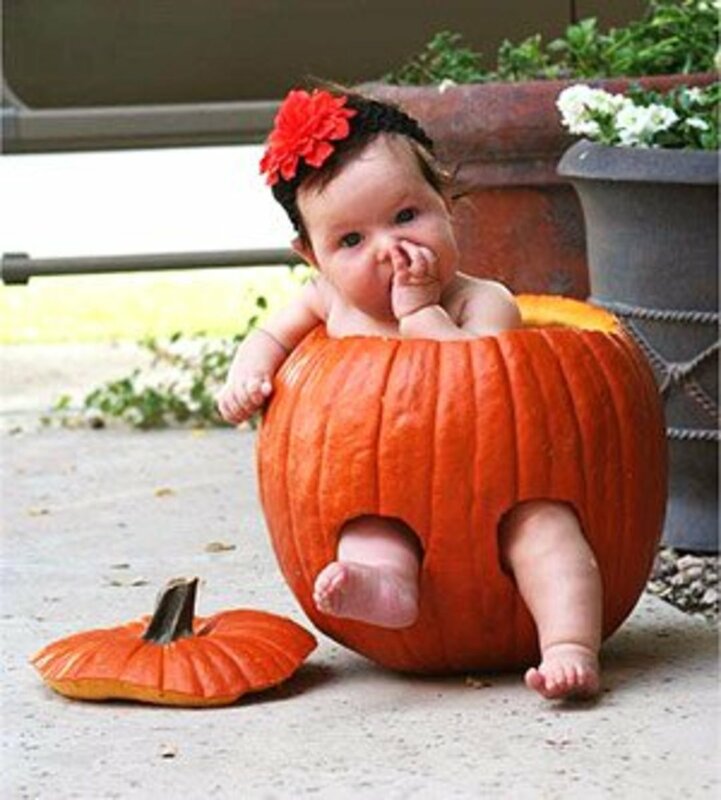 Get more fun ideas at Halloween Pumpkin Baby Shower Theme Ideas. Look at these cute Halloween pumpkin baby shower invitation ideas. We are planning a baby shower in November this year and we chose a pumpkin theme in honor of the season. It's the week after Halloween but pumpkins are really a fall theme so it's perfect. 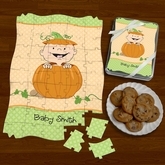 When I was searching for baby shower invitations I found some with a pumpkin baby theme and they are cute as can be. There are the kinds of invitations that can be personalized and there are the fill in styles. The fill in invites are usually much less expensive than the personalized ones, so if you have a small budget for your shower, get them. They work just as well as the personalized ones and are very cute. I love the personalized baby shower invites with the vellum layer on top but they cost about 2.00 each. Check your party budget before you buy any party supplies so you know exactly what you have to spend on each of your party supplies. 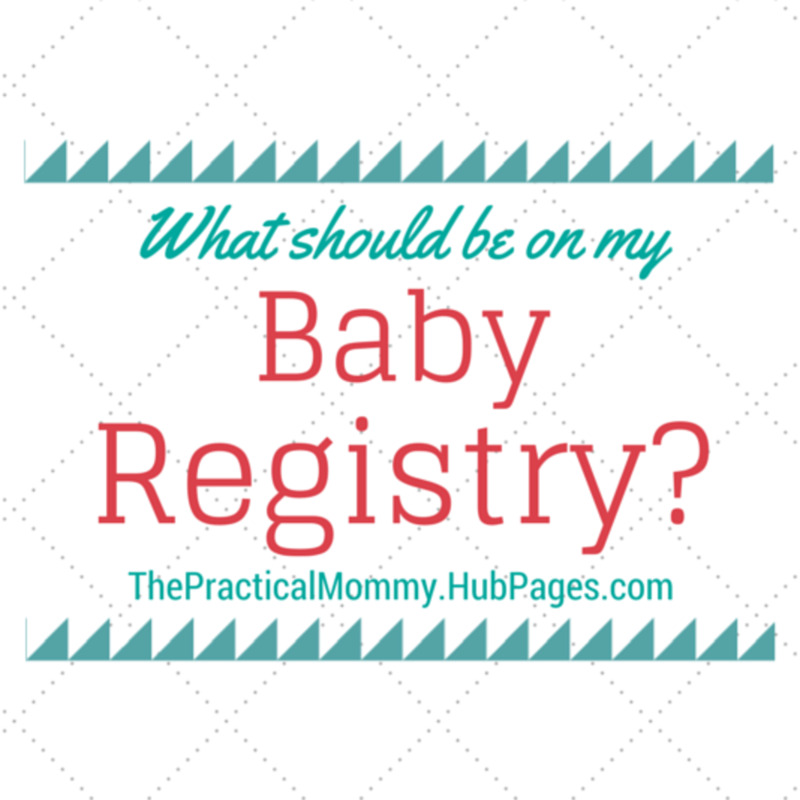 There are two baby shower themes featured on this page but they can both work together. Pumpkins and Halloween go together like Trick or Treat! If someone you know is due to have a baby in the late fall or early winter, this is a great way to celebrate the season and the birth of a new baby. Look at these fun Halloween theme shower invitations you can get. 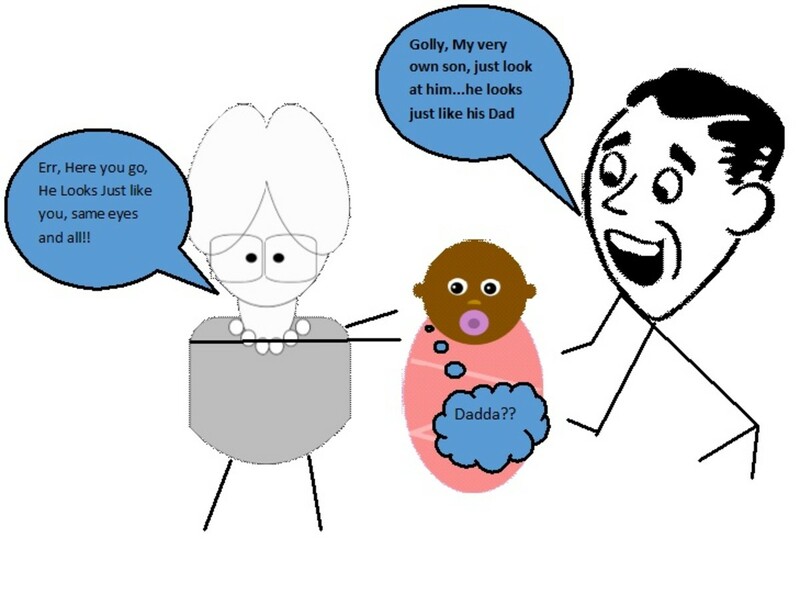 Let everyone know they are in the right place with a personalized Baby Shower Banner. A banner can really dress up your party room and make a big difference in how the room looks. Find one that matches the rest of your party supplies and hang it up. Find more information at Party Ideas Parade. It's a new and unique baby shower theme idea and it's cute as can be. You can see just how adorable this theme is on the Pumpkin Baby Shower party supplies you can see on this page. Imagine how bright and cheerful your party room will look with these sweet as can be shower supplies and that cute little pumpkin baby decorating the room. I just love it and can't wait until we see our shower decorated with these supplies. Find all the fun ideas you need to host a fall themed shower. 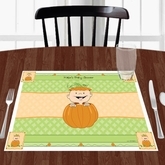 I think these party placemats really dress up the table. The solid colored plates in lime or orange match the rest of the supplies perfectly. I plan to sit mini-pumpkins around the room and on the tables as an extra decoration. The mini-pumpkins are in season and very plentiful during the fall. I plan to write the Mom To Be's name out in white dots on the pumpkins. That will look cute and as soon as I do it I will show you a picture! A Diaper Cake is always a special addition to a baby shower. 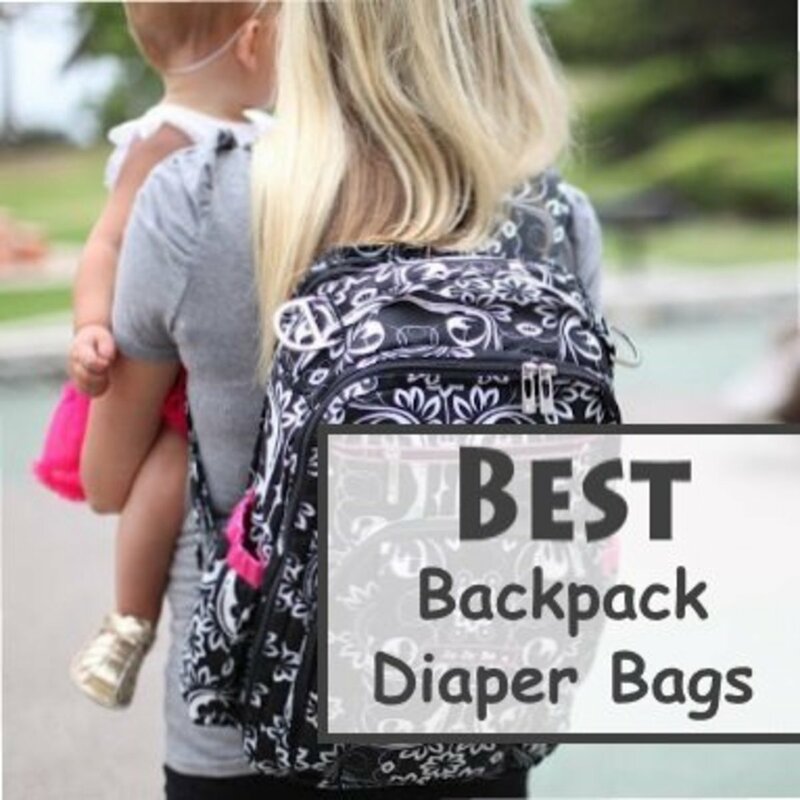 It's filled with lots of diapers, something any new mom is going to need plenty of and it's always a great party decoration too. Set it up on the present table or in the center of the party food buffet table. Look at how great the pumpkin diaper cakes I found look. You can also learn how to make your own...diaper cakes are easy to make yourself. Pumpkin Baby Shower Ideas might be new, but they are not lacking in wonderful ideas to decorate for your shower. This centerpiece bouquet is just one of the beautiful accessories you can get to match your baby shower theme. This unique centerpiece is made using a chrome stand and a pumpkin theme printed cone. 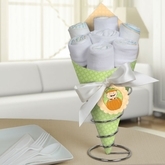 Then baby items are rolled to look like flowers and they fill this cone shaped centerpiece. The flowers consist of 6 Huggies diapers in a size 3, 2 pairs of infant sized 3 to 6 months white socks, and a white onesie in a size 3 to 6 months. It performs a double duty at your baby shower...one as a pretty table centerpiece and one as a lovely gift for the new baby. Baby Shower Favor Ideas are always a big hit at a shower. There are so many ideas you can use for a Pumpkin Baby Shower. You can get decorated and personalized water bottle labels, candy bar wrappers for mini and regular sized candy bars, body butter, lip balm, candles, coasters and even a cute puzzle with a baby and pumpkin on it. Take a look at these fun ideas. Don't Forget Cupcakes For Your Baby Shower! 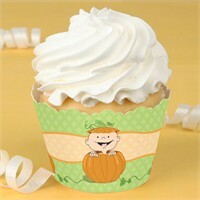 Pumpkin Wrappers for cupcakes will make your baby shower desserts look just delicious. Wrap each cupcake with this personalized, decorated wrap cup. You can also find some cute pumpkin picks to stick right in the cupcakes. Make your own cupcakes, you can even use a pumpkin spice recipe and top it with some cream cheese frosting. How about adding a bit of orange to the frosting mix...what an outstanding looking and tasting dessert you can serve to your shower guests. Do you know how to make Cake Pops? 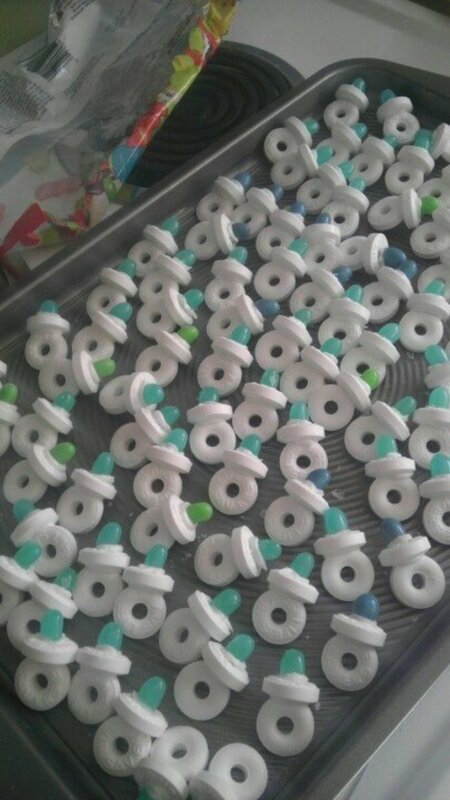 You can make them and serve them to your guests. They are the latest dessert craze and they look great. Of course, there are also some wonderful, edible cake toppers with a pumpkin design you can use too...so serve a cake, cupcakes or cake pops...or all three if you like. Let's find some Edible Pumpkin Cake Images so you can make your own baby shower cake or cupcakes. The perfect dessert to match this fun Halloween Baby Shower theme. Did you ever use an edible cake image to decorate a cake or cupcakes? It's so easy a kid can do it. Each image comes with directions for you to follow. How does this work? You get an edible image on a piece of paper. You prepare your baked cake or cupcakes, let them cool and frost them as usual. Then you simply peel the back paper off the image and place the image on your frosted dessert. The image seems to "melt" into the frosting on your cakes and it looks like you drew it on there. It's easy and you get great results. Get Your Baby Shower Supplies Today! Find the baby shower favors and supplies you need to plan and host a shower. Get some wonderful Pumpkin Baby Shower Supplies Right Here. Love these ideas. This would make for a very cute Halloween baby shower. Fall is my favorite time of year! Our son has a birthday towards the end of October, so he always has a Halloween themed party.